There are four ways to run FileBoss in administrator mode to satisfy different needs. Note that some documentation refers to Administrator mode a being Elevated. 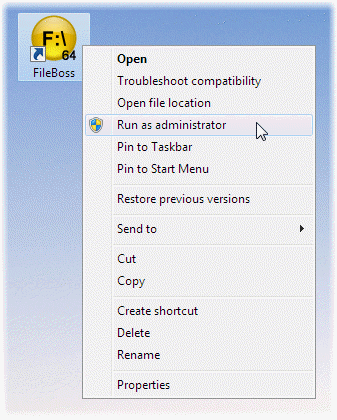 To run FileBoss in administrator mode once right click on its icon on the desktop or elsewhere and select Run as administrator from the popup menu. As with the other methods Windows will ask you to confirm the action. As with the other methods Windows will ask you to confirm whenever you click on the Administrator icon. Now you can click on the left icon to run FileBoss normally or on the right icon to run FileBoss in Administrator mode. Press Enter or click the green arrow to the right of the field. 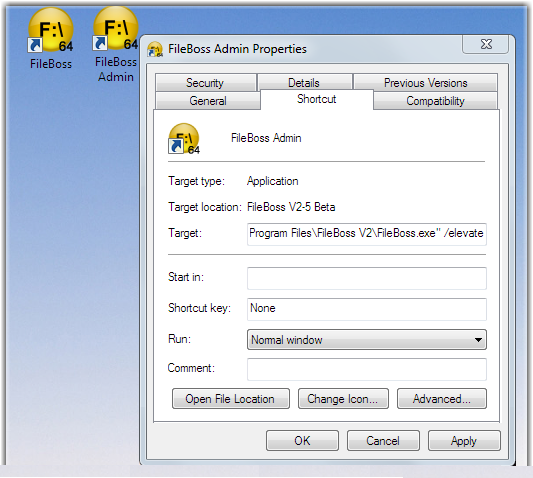 FileBoss will then start a new instance in Administrator mode and Windows will ask you for confirmation to run the program. After confirmation there will be two instances of FileBoss, the first in regular mode and the second in Administrator mode. This method will tell windows to always run FileBoss in Administrator mode not how it is started, whether that be by clicking an icon, selected it from the Start or any other menu. 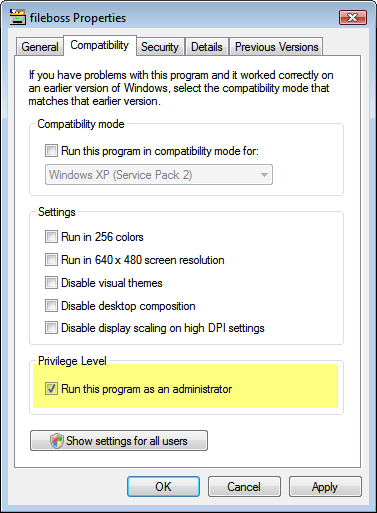 Check the Run this program as an administrator check box as highlighted below.